The orbital degrees of freedom refer to different shapes of the wave functions with degenerate energies. In recent years, optical lattices engineered by interfering laser beams offer new means to explore interacting fermions with orbital degrees of freedom the symmetries of which differ from those found in traditional solids. We show that the orbital hopping pattern alone is sufficient for producing topologically non-trivial band structures. We unveil a topological insulator phase of fermions on a two-leg ladder of double-well lattices, similar to those recently realized in experiments. Understanding the quantum phases of interacting fermions is a fundamental, chanllenging problem in many-body physics. Broken symmetry phases, such as spin density wave order in antiferromagnetic metal Chromium, or the p-wave superfluid order in liquid Helium 3, have long been known and well understood. Motivated by recent experiments, we find theoretically that an unconventional spin-density wave phase with p-wave orbital symmetry in ultracold Fermi gases of polar molecules and magnetic atoms. 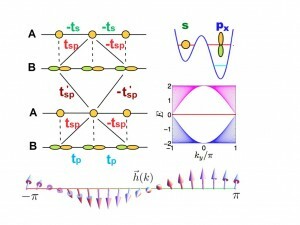 It is a kind of magnetic order formed on bonds connecting the lattice sites, and can be viewed as the particle-hole analog of p-wave superconductivity. Synthesis and characterization of magnetic nanostructures is an important aspect of research in nanoscience. In order to improve the characteristics of nanomaterials based devices, it is important to understand the structure property relation as well as the mechanism of the magnetic ordering. The goal of our research is to investigate the suitability of nanostructured magnetic materials for applications in high density magnetic data storage such as magnetic tapes, and hard disk media. Some of these nanostructures are rodlike metallic iron nanopartcles g-Fe2O3 nanoparticles, PZT thin films with Co nanostructures, Co/Fe multilayers, core-shell structured FePtM (M= Au, Cu) nanoparti nanoparticles. The orientatonal ordering of nanostructures are investigated using small angle neutron scattering, and element specific magnetic behavior is determined using x-ray magnetic circular dichroism spectroscopy. Ultracold gases refer to quantum degenerate gases of atoms (such as Rubidium, Potassium or Lithium) or molecules confined in vacuum by laser beams and cooled down to nano-Kelvin temperatures (one billionth degree above absolute zero). These systems offer well-controlled settings to test and advance our basic understanding of the collective behaviors of strongly interacting quantum particles. They can be viewed as the latest breed of quantum matter, trailing a long line of extraordinary examples such as superfluid helium, high temperature superconductors, and antiferromagnets. The research is aimed at expanding our knowledge about quantum phases of matter, and gaining insights for better design and manipulation of quantum materials. We are particularly interested in the quantum phases of Fermi gases in new parameter regimes brought by ongoing cold atoms experiments. Examples of research topics include the exact thermodynamics of low dimensional Fermi gases, topological phases of cold atoms on high orbital bands, as well as the phase diagrams of dipolar Fermi gases. This line of research is currently supported by National Science Foundation, Air Force Office of Scientific Research, and National Institute of Standards and Technology. Superconductivity is a hall mark macroscopic quantum mechanical phenomenon. At low temperatures, many materials become superconductors with vanishing electrical resistance. Moreover, (weak) magnetic field gets expelled from the bulk. A conventional superconductors can be thought as a “perfect” quantum fluid of pairs of electrons, loosely bound together by some attractive interaction between electrons, all sharing the same quantum state. Superconductor has become a leading competitor in building new architects of quantum devices, circuits, and qubits (the fundamental building block for a quantum computer). Our research focuses on superconductors driven out of equilibrium, especially in spatial inhomogeneous systems as found in devices. The goal is to understand the collective, quantum mechanical dance of many electrons when they are driven out of equilibrium. Modeling the dynamics of charge, spin, and energy flow requires techniques such as quantum field theory and nonequilibrium statistical mechanics. 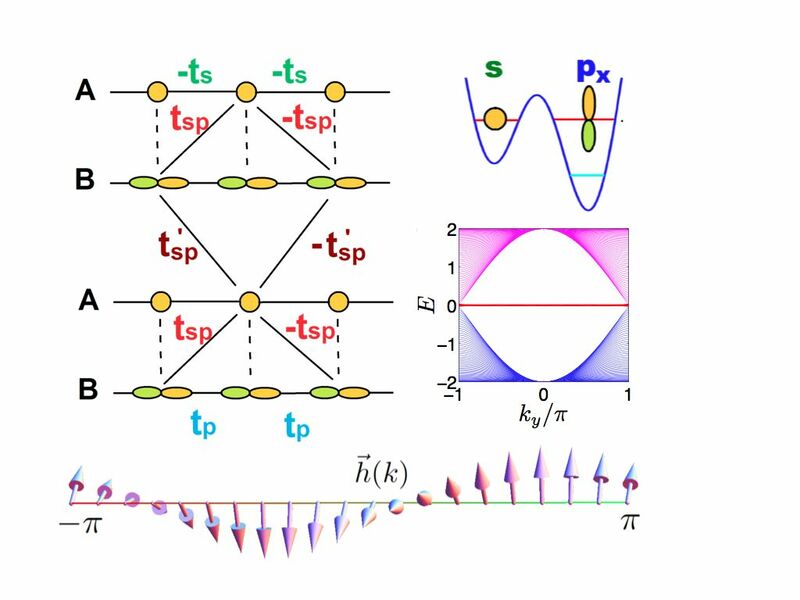 Currently, our group is actively studying the hybrid structures of superconductors and topological insulators or other spin-active (magnetic or spin-orbit coupled) materials. Research in this direction may contribute to the next generation quantum devices and circuits that outperform present technologies. The Magnetic Resonance Laboratory (MRL) is directed by Dr. Karen L. Sauer, of the School of Physics, Astronomy, and Compuational Sciences. The research of MRL seeks to understand and exploit spin-dynamics in such systems as nuclear quadrupole resonance and optically pumped atoms. In addition, we conduct research to push the noise in such systems to their fundamental limit, to reveal the full capability of magnetic resonance at low-fields both as an analytic tool and for the detection of contraband substances. K.L. Sauer, Pushing Low-field Magnetic Resonance to the Limit, Early Faculty CAREER Award from National Science Foundation, 2006-2012. K.L. Sauer (GMU) and M.V. Romalis (Princeton), Collaborative Research: EXP-SA: Quantum magnetometer for detection of explosives with nuclear quadrupole resonance, National Science Foundation, 2007-2011. K.L. Sauer (GMU) and M.V. Romalis (Princeton), Detecting Explosives with an NQR Integrated Magnetometer (DENIM), BAA Award from Naval Research Laboratory and DoD, Combating Terrorism Technology Task Force, 2005-2007. K.L. Sauer, ADVANCE Fellowship from Increasing the Participation of Women in Academic Science and Engineering Careers, Mathematical and Physical Sciences Division, National Science Foundation, 2002-2006. K.L. Sauer, Double resonance in nuclear quadrupole resonance , Ralph E. Powe Junior Faculty Enhancement Award from Oak Ridge Associated Universities. 2003-2004. K.L. Sauer, An Optically-Pumped Nuclear Spin Polarizer for NMR of Ultrathin Semiconductor Alloys funded by the Naval Research Laboratory under Code 6122. 2008-present. K.L. Sauer, Improving the detection of explosives through the use of nuclear quadrupole resonance funded by the Naval Research Laboratory under Code 6122. 2002-2008. Models of atomic interaction in materials. Development of semi-empirical many-body potentials from experimental data and first-principles calculations. Interfaces in materials, including grain and interphase boundaries. Interfacial motion, segregation, chemical reactions and cohesion. Atomistic theory and modeling of interfacial kinetics in materials. Relationships between interfacial structure, chemistry, and diffusion. Defects and diffusion in intermetallic compounds: diffusion mechanisms, calculation of diffusion coefficients, relation to creep and other high-temperature properties. Plastic deformation and fracture of metals and intermetallic compounds. Grain boundary sliding and cleavage. Interfaces in Electronic and Structural Materials. Funding Agency: US Department of Energy, BES, Division of Materials Sciences. Dislocation Diffusion in Metallic Materials. Funding Agency: Air Force Office of Scientific Research. Reliable Interatomic Potentials for Advanced Materials Systems. Funding Agency: National Aeronautics and Space Administration (NASA). T. Frolov and Y. Mishin: Liquid nucleation at superheated grain boundaries, Phys. Rev. Letters, 2011, 106, 155702. T. Frolov and Y. Mishin: Stable nanocolloidal structures in metallic systems, Phys. Rev. Letters, 2011, 104, 055701. F. Apostol and Y. Mishin: Angular-dependent interatomic potential for the aluminum-hydrogen system, Phys. Rev. B, 2010, 82, 144115. G. P. Purja Pun and Y. Mishin: Molecular dynamics simulation of the martensitic phase transformation in NiAl alloys, J. Phys: Condens. Matter, 2010, 22, 395403. Y. Mishin and W. J. Boettinger: Thermodynamic model of hydride formation and dissolution in spherical particles, Acta Mater., 2010, 58, 4968. Y. Mishin, M. Asta and Ju Li: Atomistic modeling of interfaces and their impact on microstructure and properties, Acta Mater., 2010, 58, 1117. G. P. Purja Pun and Y. Mishin: A molecular dynamics study of self-diffusion in the cores of screw and edge dislocations in aluminum, Acta Mater., 2009, 57, 5531. T. Frolov and Y. Mishin: Molecular dynamics modeling of self-diffusion along a triple junction, Phys. Rev. B, 2009, 79, 174110. Y. Mishin, W. J. Boettinger, J. A. Warren and G. B. McFadden: Thermodynamics of grain boundary premelting in alloys. I. Phase-field modeling, Acta Mater., 2009, 57, 3771. T. Frolov and Y. Mishin: Temperature dependence of the surface free energy and surface stress: An atomistic calculation for Cu(110), Phys. Rev. B, 2009, 79, 045430. V. A. Ivanov and Y. Mishin: Dynamics of grain boundary motion coupled to shear deformation: An analytical model and its verification by molecular dynamics, Phys. Rev. B, 2008, 78, 064106. Y. Mishin, A. Suzuki, B. P. Uberuaga and A. F. Voter: Stick-slip behavior of grain boundaries studied by accelerated molecular dynamics , Phys. Rev. B, 2007, 75, 224101. J. W. Cahn, Y. Mishin and A. Suzuki: Coupling grain boundary motion to shear deformation , Acta Mater., 2006, 54, 4953-4975. Y. Mishin: Atomistic modeling of the gamma and gamma’ phases of the Ni-Al system , Acta Mater. , 2004, 52, 1451-1467. Y. Mishin, M. J. Mehl and D. A. Papaconstantopoulos: Embedded-atom potential for B2-NiAl , Phys. Rev. B, 2002, 65, p. 224114. Y. Mishin, M. R. Sorensen and A. F. Voter: Calculation of point defect entropy in metals , Phil. Mag. A, 2001, 81, N11, p. 2591-2612. Y. Mishin, M. J. Mehl, D. A. Papaconstantopoulos, A. F. Voter and J. D. Kress: Structural stability and lattice defects in copper: Ab initio, tight-binding and embedded-atom calculations, Phys. Rev. B, 2001, 63, N22, article # 224106. M. R. Sorensen, Y. Mishin and A. F. Voter: Diffusion mechanisms in Cu grain boundaries , Phys. Rev. B, 2000, 62 , N6, pp. 3658-3673.